Nineteenth century rag doll with ceramic head and limbs. In the late summer of 2015 I spent a pleasurable couple of hours in Ghent’s MIAT museum of industry and technology. On my way back into the city centre I passed an antiques centre, doing desultory business on a warm and sleepy Sunday afternoon. In a display of vintage railway rolling stock I noticed a single wagon that I could afford to buy – an O gauge (1:45) tipper wagon manufactured by Marklin in Germany before 1946. I handed over €15 and carried on, triumphant. The wagon is a relatively crude representation of its original. It is made from tinplate, held together by tabs fitted through slots and bent over. The body of the wagon is held upright by a simple U-shaped double-ended rod that if moved from its upright position allows the body to tip sideways, dumping its load (presumably into some form of hopper). The wagon’s scarred paintwork shows evidence of a fair degree of use. Beneath the truck’s body is a label in several languages indicating where it should be oiled. The wagon is firstly a personal souvenir of Ghent, something that will trigger memories of my visit. It also has a number of other meanings for me, as its collector. It will join a small number of other railway artefacts on display in my study, including a much smaller tipper wagon in HO9 scale (1:87). This collection is evidence of a continuing interest in miniature railways and of a so far frustrated dream of constructing a model railway of my own. As a tinplate railway artefact it also reminds me of the long-lost Hornby O gauge clockwork railway my brothers and I would construct around the floor of our bedroom, the track winding amongst the legs of our beds. The wagon, despite being of a reasonable size, is hugely simplified. This reflects the limits of affordable technologies at the time of its design and manufacture. A present-day example would use plastic or metal casting techniques allowing much more accurate detailing. These are, in their turn, being replaced and refined by 3D printing technologies that will eventually no doubt become so commonplace that they will allow low-cost replication of almost any original. Yet the relatively crude Marklin wagon still has its attractions. Despite its simplicity, when it was created the wagon would have satisfied the demands of its target purchaser. It was robust enough to be handled roughly and used on track that was usually located on the floor. It had a semi-automated action (a trackside trigger would strike the lever to operate the tipping action). Clockwork trains had limited controls, so derailments, both accidental and deliberate, were frequent, so rolling stock had to be robust. And perhaps for reasons, some of which might be similar to my own, these inaccurate, battered objects are still loved, and enthusiastically and sometimes obsessively collected. 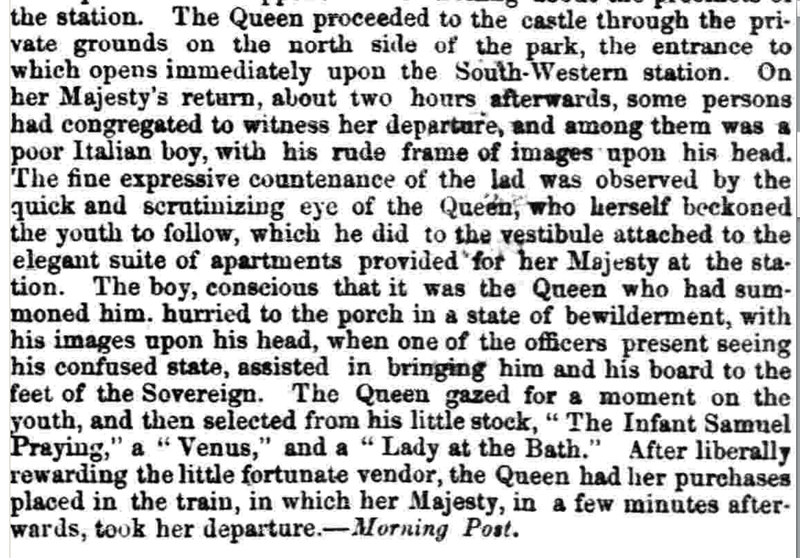 In 1853, Queen Victoria bought three objects from an “Italian Boy”. I wonder if they arrested in the Royal Collection, probably in some dusty store room?